'I have been in the industry for some time now and I understand the pressure as an actor, as well as the pressure a journalist goes though,' Rajeev Khandelwal tells Rajul Hegde. 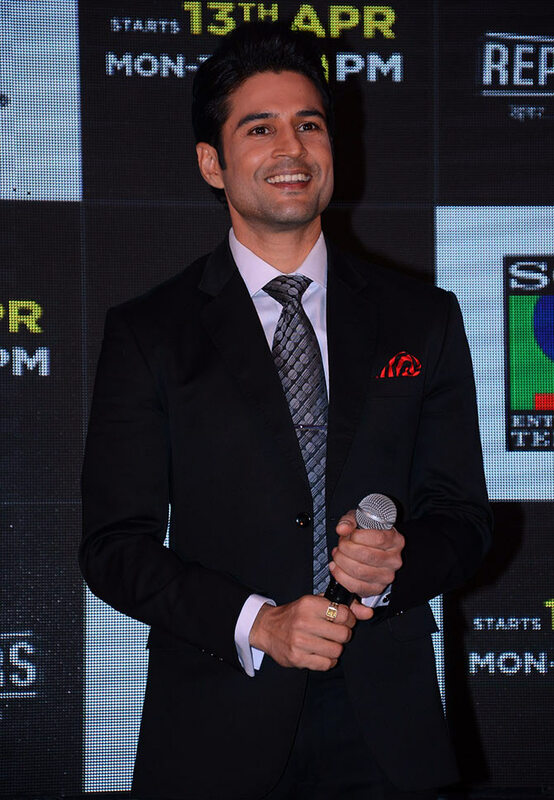 Rajeev Khandelwal's telly comeback recently went viral. It wasn't because we missed the Kahin To Hoga star (well, of course, we did!) but because the promos of his new show Reporters saw him kiss actress Kritika Kamra and her slapping him for it. The actor discusses his new show with Rediff.com contributor Rajul Hegde. What’s been the response to the Reporters promos, especially the one where you kiss co-star Kritika Kamra and she slaps you? It is mind-blowing -- 200 per cent more than we expected! The idea was to highlight the slap, not the kiss. When I heard the promo idea, I instantly knew it was bang on because it had the right attitude and tone. Is there a clash between news and ethics? If you have to deliver news, you have to ignore ethics at times to put your point across. This is what Kabir (the character he plays in the serial) does. As Rajeev, I respect ethics. I have been in the industry for some time now and I understand the pressure as an actor, as well as the pressure a journalist goes though. I think there has to be a balance of both. How do you think television has changed? I have come back to television like a newcomer and I am nervous. In terms of pressure, not much has changed. You keep reinventing yourself every week. Who is your favourite television journalist? I think Ravish Kumar (NDTV) is nice. He does it very subtly. I watched him present the news of the land bill. He was walking with the farmers, having a conversation but you could see the real pulse of the farmers. He put his point across beautifully, without screaming or being dramatic. And we all love Radjeep Sardesai; he is fantastic. I like Dr Prannoy Roy a lot because when he talks, there is gravity. As an actor, did you ever try to stop your personal news coming out in the media? When I was dating Manjiri (his wife now), someone was putting up a story with her picture. Since I had already admitted that I was dating someone, I requested the editor not to carry the news with her picture as our families would not be comfortable since they are not from the industry. The editor said it has come out already through Facebook and if he doesn’t use it, someone else would. I had to call up my parents and prepare them before it came out. What kind of a person is Kabir, the character you play in Reporters? Kabir is an amalgamation of Arnab Goswami, Rajeep Sardesai, Shekar Gupta and Rahul Kanwal. People will not find anything unreal in Reporters. The show doesn’t highlight any particular social subject. It’s about the behind-the-stage drama of journalism. It focuses on the news room before and after going live. This kind of show has not been made in India till now. What have you learnt from the show? I understand deadlines and why a reporter waits for so long for a story. And why they will not carry a story that I thought would be carried. What is your co-star Kritika Kamra like? I was pleasantly surprised to see someone who is as passionate and committed as I am. She is always in sync and throws no tantrums. You have a very loyal fan following. Have you had any 'crazy fan' moments? There was this 16-year-old girl, who stood in the rain for an entire day waiting for me. The cops came to my house at night and took me to the society office. I was so nervous because I didn’t know what had happened. The society members told me that she was all right and was washing her face in the washroom. I felt like giving her one tight slap. I told her that she was giving tension to her family and me. At 12.30 at night she sat in the police van smiling and saying goodbye to me. The next day, I sent my team to find out about her from the police station. Recently, I got a call from a fan claiming to be a research student, who needed to interview a celebrity. I told my manager to find out more about this girl because I thought something was fishy. My manager found out that she had been waiting to speak to me and her return tickets were booked. I decided to do the interview in the presence of my staff. At first, she asked me general questions. We spoke about a lot of things and it looked genuine. Then she told me she had lied and that there was no research paper. She told me she wants to marry me. I told her I was already married, but she would not listen. She said it would be our little secret. A few days later, I got a call from a fan who told me she had a medical condition and she wanted to meet me. I agreed to it, but told my staff to remain close by. We spoke and then she suddenly tells me that had lied. She said she was the sister of the previous female fan who had insisted on marrying me. I lost my head. I asked her how she could let her sister do something so stupid. She calmly responded that I should marry her any way. That really freaked me out. Move over Dhoni, we want to watch Emraan Hashmi!